Arakkal Palace is situated in Kannur district. This palace is the Royal residence of the Arakkal family who is the only Royal Muslim dynasty in Kerala to control the coastal areas and Lakshadweep. The palace is around 200 years old and is known as Arakkal kettu. This palace is considered as a protected monument by the Archaeological department. The Arakkal kettu consists of the palace, administrative block, mosques and residential building. There is a bell tower near the gate and has a huge bronze bell is hung there. The mosques here are worth seeing. 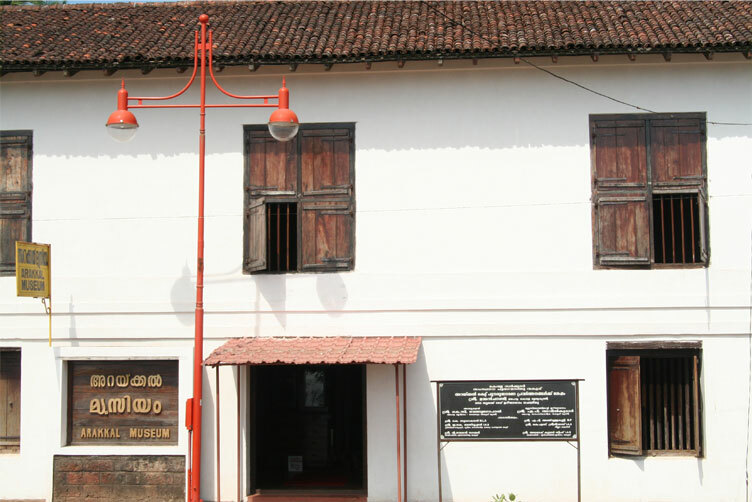 The Arakkal museum is a part of the Arakkal palace. The museum was once the durbar hall and it was converted into a museum in the year 2005. Even though the renovations have been done by the state government, it is still under the ownership of the Arakkal family. The museum is double storied and the various artifacts are kept for display in the second floor. Some of the items that are displayed here include a shehnai which is a musical instrument, old model fans, telephones, ancient compass, royal furniture, glass, silver and bronze utensils, wooden box, hunting equipment such as spear, sword etc.